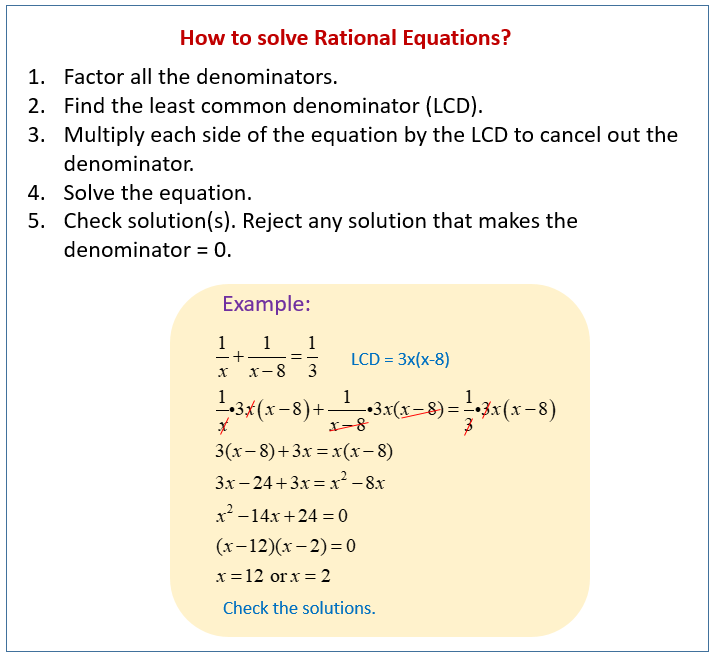 Examples, Solutions, videos, worksheets, and activities to help Algebra students learn how to solve rational equations. In a rational equation, there will be a variable in the denominator of a fraction. Use cross multiplying when solving rational equations. Students learn that when solving advanced rational equations, the first step is to factor each of the denominators, if possible, then multiply both sides of the equation by the common denominator for all the fractions in order to get rid of the fractions. Note that in this lesson, once the fractions have been removed from the equation, the result will be a polynomial equation, so remember the rules for solving polynomial equations: set the equation equal to zero, then factor. Finally, check each solution to see if it makes a denominator in the original equation equal to zero. If so, then it cannot be a solution to the equation.